Shimon Peres (/ʃɪˈmoʊn ˈpɛrɛs/; Hebrew: שמעון פרס‎, listen (help·info); born Szymon Perski; 2 August 1923 – 28 September 2016) was an Israeli politician who served as the ninth President of Israel (2007–2014), the Prime Minister of Israel (twice), and the Interim Prime Minister, in the 1970s to the 1990s. He was a member of twelve cabinets and represented five political parties in a political career spanning 70 years. Peres was elected to the Knesset in November 1959 and except for a three-month-long hiatus in early 2006, was in office continuously until he was elected President in 2007. At the time of his retirement in 2014, he was the world's oldest head of state and was considered the last link to Israel's founding generation. From a young age, he was renowned for his oratorical brilliance, and was chosen as a protégé by David Ben-Gurion, Israel's founding father. He began his political career in the late 1940s, holding several diplomatic and military positions during and directly after the 1948 Arab–Israeli War. His first high-level government position was as Deputy Director-General of Defense in 1952 which he attained at the age of 28, and Director-General from 1953 until 1959. In 1956, he took part in the historic negotiations on the Protocol of Sèvres described by British Prime Minister Anthony Eden as the "highest form of statesmanship". In 1963, he held negotiations with U.S. President John F. Kennedy, which resulted in the sale of Hawk anti-aircraft missiles to Israel, the first sale of U.S. military equipment to Israel. Peres represented Mapai, Rafi, the Alignment, Labor and Kadima in the Knesset, and led Alignment and Labor. Peres first succeeded Yitzhak Rabin as Acting Prime Minister briefly during 1977, before becoming Prime Minister from 1984 to 1986. As Foreign Minister under Prime Minister Rabin, Peres engineered the 1994 Israel–Jordan peace treaty, and won the 1994 Nobel Peace Prize together with Rabin and Yasser Arafat for the Oslo Accords peace talks with the Palestinian leadership. In 1996, he founded the Peres Center for Peace, which has the aim of "promot[ing] lasting peace and advancement in the Middle East by fostering tolerance, economic and technological development, cooperation and well-being." After suffering a stroke, Peres died on 28 September 2016 near Tel Aviv. Peres was a polyglot, speaking Polish, French, English, Russian, Yiddish, and Hebrew, although he never lost his Polish accent when speaking in Hebrew. In his private life, he was a poet and songwriter, writing stanzas during cabinet meetings, with some of his poems later being recorded as songs in albums. As a result of his deep literary interests, he could quote from Hebrew prophets, French literature, and Chinese philosophy with equal ease. Shimon Peres was born Szymon Perski, on 2 August 1923, in Wiszniew, Poland (now Vishnyeva, Belarus), to Yitzhak (1896–1962) and Sara (1905–1969, née Meltzer) Perski. The family spoke Hebrew, Yiddish and Russian at home, and Peres learned Polish at school. He then learned to speak English and French. His father was a wealthy timber merchant, later branching out into other commodities; his mother was a librarian. Peres had a younger brother, Gershon. He was related to the American film star Lauren Bacall (born Betty Joan Perske), and they were described as first cousins, but Peres said, "In 1952 or 1953, I came to New York... Lauren Bacall called me, said that she wanted to meet, and we did. We sat and talked about where our families came from, and discovered that we were from the same family... but I'm not exactly sure what our relation is... It was she who later said that she was my cousin; I didn't say that". Peres told Rabbi Menachem Mendel Schneerson that he had been born as a result of a blessing his parents had received from a chassidic rebbe and that he was proud of it. Peres' grandfather, Rabbi Zvi Meltzer, a grandson of Rabbi Chaim Volozhin, had a great impact on his life. In an interview, Peres said: "As a child, I grew up in my grandfather's home. … I was educated by him. … My grandfather taught me Talmud. It was not as easy as it sounds. My home was not an observant one. My parents were not Orthodox but I was Haredi. At one point, I heard my parents listening to the radio on the Sabbath and I smashed it." When he was a child, Peres was taken by his father to Radun' to receive a blessing from Rabbi Yisrael Meir Kagan (known as "the Chofetz Chaim"). As a child, Peres would later say, "I did not dream of becoming president of Israel. My dream as a boy was to be a shepherd or a poet of stars." He inherited his love of French literature from his maternal grandfather. In 1932, Peres' father immigrated to Mandatory Palestine and settled in Tel Aviv. The family followed him in 1934. He attended Balfour Elementary School and High School, and Geula Gymnasium (High School for Commerce) in Tel Aviv. At 15, he transferred to Ben Shemen agricultural school and lived on Kibbutz Geva for several years. Peres was one of the founders of Kibbutz Alumot. In 1941, he was elected Secretary of HaNoar HaOved VeHaLomed, a Labor Zionist youth movement, and in 1944 returned to Alumot, where he had an agricultural training and worked as a farmer and a shepherd. At age 20, he was elected to the HaNoar HaOved VeHaLomed national secretariat, where he was only one of two Mapai party supporters, out of the 12 members. Three years later, he took over the movement and won a majority. The head of Mapai, David Ben-Gurion, and Berl Katznelson began to take an interest in him, and appointed him to Mapai's secretariat. 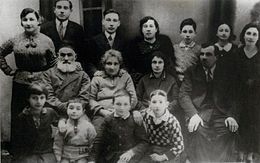 All of Peres' relatives who remained in Wiszniew in 1941 were murdered during the Holocaust, many of them (including Rabbi Meltzer) burned alive in the town's synagogue. In 1945, Peres married Sonya Gelman, who preferred to remain outside the public eye. They had three children. In 1952, he was appointed Deputy Director-General of the Ministry of Defense, and the following year, he became Director-General. At age 29, he was the youngest person to hold this position. He was involved in arms purchases and establishing strategic alliances that were important for the State of Israel. He was instrumental in establishing close relations with France, securing massive amounts of quality arms that, in turn, helped to tip the balance of power in the region. Owing to Peres' mediation, Israel acquired the advanced Dassault Mirage III French jet fighter, established the Dimona nuclear reactor and entered into a tri-national agreement with France and the United Kingdom, positioning Israel in what would become the 1956 Suez Crisis. Peres continued as a primary intermediary in the close French-Israeli alliance from the mid-1950s, although from 1958, he was often involved in tense negotiations with Charles de Gaulle over the Dimona project. From 1954, as Director-General of the Ministry of Defense, Peres was involved in the planning of the 1956 Suez War, in partnership with France and Britain. Peres was sent by David Ben-Gurion to Paris, where he held secret meetings with the French government. Peres was instrumental in negotiating the Franco-Israeli agreement for a military offensive. In November 1954, Peres visited Paris, where he was received by the French Defense Minister Marie-Pierre Kœnig, who told him that France would sell Israel any weapons it wanted to buy. By early 1955, France was shipping large amounts of weapons to Israel. In April 1956, following another visit to Paris by Peres, France agreed to disregard the Tripartite Declaration, and supply more weapons to Israel. During the same visit, Peres informed the French that Israel had decided upon war with Egypt in 1956. Throughout the 1950s, an extraordinarily close relationship existed between France and Israel, characterised by unprecedented cooperation in the fields of defense and diplomacy. For his work as the architect of this relationship, Peres was awarded the highest order of the French, the Legion of Honor, as Commander. At Sèvres, Peres took part in planning alongside Maurice Bourgès-Maunoury, Christian Pineau and Chief of Staff of the French Armed Forces General Maurice Challe, and British Foreign Secretary Selwyn Lloyd and his assistant Sir Patrick Dean. Britain and France enlisted Israeli support for an alliance against Egypt. The parties agreed that Israel would invade the Sinai. Britain and France would then intervene, purportedly to separate the warring Israeli and Egyptian forces, instructing both to withdraw to a distance of 16 kilometres from either side of the canal. The British and French would then argue, according to the plan, that Egypt's control of such an important route was too tenuous, and that it needed be placed under Anglo-French management. The agreement at Sèvres was initially described by British Prime Minister Anthony Eden as the "highest form of statesmanship". The three allies, especially Israel, were mainly successful in attaining their immediate military objectives. However, the extremely hostile reaction to the Suez Crisis from both the United States and the USSR forced them to withdraw, resulting in a failure of Britain and France's political and strategic aims of controlling the Suez Canal. On 27 June 1976, Peres, as Minister of Defense, along with Rabin, had to deal with a coordinated act of terrorism when 248 Paris-bound travelers on an Air France plane were taken hostage by pro-Palestinian hijackers and flown to Uganda, Africa, 2,000 miles away. Peres and Rabin were responsible for approving what became known as the Entebbe rescue operation, which took place on 4 July 1976. The rescue boosted the Rabin government's approval rating with the public. The only Israeli soldier that was killed during the successful rescue operation was its commander, 30-year-old Lieutenant Colonel Jonathan Netanyahu, older brother of Benjamin Netanyahu. In the few days leading up to the operation, Peres and Rabin leaned toward different solutions. Rabin took steps to initiate negotiations, seeing no other option. Peres, however, felt that negotiating with terrorists, who were demanding the release of prisoners, would in effect be surrender, and thought a rescue operation should be planned. Peres then organized a secret Israel Crisis Committee to come up with a rescue plan. When a plan had been made, he met with commander Netanyahu a number of times. During one of their final private meetings, they both examined maps and went over precise details. Peres later said of Netanyahu's explanation, "My impression was one of exactitude and imagination," saying that Netanyahu seemed confident the operation would succeed with almost no losses. Netanyahu left the meeting understanding that Peres would do everything in his power to see that the operation went smoothly. Peres then went unannounced to Moshe Dayan, the former Minister of Defense, interrupting his dinner with friends in a restaurant, to show him the latest plan to get his opinion. Peres told Dayan of the objections that had been raised by Rabin and Chief of Staff, Mordechai Gur. Dayan dismissed the objections after reviewing the written details: "Shimon," he said, "this is a plan that I support not one hundred percent but one hundred and fifty percent! There has to be a military operation." Peres later got the approval from Gur, who became fully supportive. Peres then took the plan to Rabin, who had been lukewarm and still didn't like the risks, but he reluctantly approved the plan after Peres answered a number of key questions and Rabin learned that the cabinet had also endorsed it. Peres succeeded Rabin as party leader prior to the 1977 elections when Rabin stepped down in the wake of a foreign currency scandal involving his wife. As Rabin could not legally resign from the transition government, he officially remained Prime Minister, while Peres became the unofficial acting Prime Minister. Peres led the Alignment to its first ever electoral defeat, when Likud under Menachem Begin won sufficient seats to form a coalition that excluded the left. After only a month on top, Peres assumed the role of opposition leader. After turning back a comeback bid by Rabin in 1980, Peres led his party to another, narrower, loss in the 1981 elections. In the 1984 elections, the Alignment won more seats than any other party but failed to muster the majority of 61 mandates needed to form a left-wing coalition. Alignment and Likud agreed to an unusual "rotation" arrangement, or unity government, in which Peres would serve as Prime Minister and the Likud leader Yitzhak Shamir would be Foreign Minister, swapping positions midway through the term. A highlight of this time in office was a trip to Morocco to confer with King Hassan II, as well as a long-range Israeli airstrike against the PLO headquarters in Tunis. From 1990, Peres led the opposition in the Knesset until, in early 1992, he was defeated in the first primary elections of the new Israeli Labor Party (which had been formed by the consolidation of the Alignment into a single unitary party) by Yitzhak Rabin, whom he had replaced fifteen years earlier. Peres remained active in politics, however, serving as Rabin's foreign minister from 1992. Secret negotiations with Yasser Arafat's PLO organization led to the Oslo Accords, which won Peres, Rabin and Arafat the Nobel Peace Prize. But in 2002, members of the Norwegian committee that awards the annual Nobel Peace Prize stated they regretted that Mr Peres' prize could not be recalled. Because he had not acted to prevent Israel's re-occupation of Palestinian territory, he had not lived up to the ideals he expressed when he accepted the prize, and he was involved in human rights abuses. After Rabin's assassination in 1995, Peres served as Acting Prime Minister and Acting Defense Minister for seven months until the 1996 elections, during which he attempted to maintain the momentum of the peace process. On 26 October 1994, Jordan and Israel signed the Israel–Jordan peace treaty, which had been initiated by Prime Minister Yitzhak Rabin and Foreign Minister Shimon Peres. The ceremony was held in the Arava valley of Israel, north of Eilat and near the Jordanian border. Prime Minister Rabin and Prime Minister Abdelsalam al-Majali signed the treaty and the President of Israel Ezer Weizman shook hands with King Hussein. US President Bill Clinton observed, accompanied by US Secretary of State Warren Christopher. The treaty brought an end to 46 years of official war between Israel and Jordan. On 11 April 1996, Prime Minister Peres initiated Operation Grapes of Wrath, which was triggered by Hezbollah Katyusha rockets fired into Israel in response to the killing of two Lebanese by an IDF missile. Israel conducted massive air raids and extensive shelling in southern Lebanon. 106 Lebanese civilians died in the shelling of Qana, when a UN compound was hit in an Israeli shelling. In 1996, he founded the Peres Center for Peace, which has the aim of "promot[ing] lasting peace and advancement in the Middle East by fostering tolerance, economic and technological development, cooperation and well-being." During his term, Peres promoted the use of the Internet in Israel and created the first website of an Israeli prime minister. However, he was narrowly defeated by Benjamin Netanyahu in the first direct elections for Prime Minister in 1996. In 1997, he did not seek re-election as Labor Party leader and was replaced by Ehud Barak. 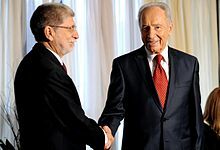 Barak rebuffed Peres's attempt to secure the position of party president and upon forming a government in 1999 appointed Peres to the minor post of Minister of Regional Co-operation. In 2000, Peres ran for a seven-year term as Israel's President, a ceremonial head of state position which usually authorizes the selection of Prime Minister. However, he lost to Likud candidate Moshe Katsav. Katsav's victory was attributed in part to evidence that Peres planned to use the position to support the increasingly unpopular peace processes of the government of Ehud Barak. Peres lost the chairmanship of the Labor Party in November 2005, in advance of the 2006 elections. As party leader, he favored putting off the elections for as long as possible. He claimed that an early election would jeopardize both the September 2005 Gaza withdrawal plan and the standing of the party in a national unity government with Sharon. However, the majority pushed for an earlier date, as younger members of the party, among them Amir Peretz, Ophir Pines-Paz and Isaac Herzog, overtook established leaders such as Binyamin Ben-Eliezer and Haim Ramon in the party ballot to divide up government portfolios. Peres lost the leadership election with 40% to Peretz's 42.4%. On 30 November 2005 Peres announced that he was leaving the Labor Party to support Ariel Sharon and his new Kadima party. In the immediate aftermath of Sharon's debilitating stroke, there was speculation that Peres might take over as leader of the party; most senior Kadima leaders, however, were former members of Likud and indicated their support for Ehud Olmert as Sharon's successor. On 13 June 2007, Peres was elected President of the State of Israel by the Knesset. 58 of 120 members of the Knesset voted for him in the first round (whereas 38 voted for Reuven Rivlin, and 21 for Colette Avital). His opponents then backed Peres in the second round and 86 members of the Knesset voted in his favor, while 23 objected. He resigned from his role as a Member of the Knesset the same day, having been a member since November 1959 (except for a three-month period in early 2006), the longest serving in Israeli political history. Peres was sworn in as President on 15 July 2007. On 20 November 2008, Peres received an honorary knighthood, Knight Grand Cross of the Order of St Michael and St George from Queen Elizabeth II in Buckingham Palace in London. In June 2011, he was awarded the honorary title of sheikh by Bedouin dignitaries in Hura for his efforts to achieve Middle East peace. Peres thanks his hosts by saying "This visit has been a pleasure. I am deeply impressed by Hura. You have done more for yourselves than anyone else could have". He told the Mayor of Hura, Dr. Muhammad Al-Nabari, and members of Hura's governing council, that they were "part of the Negev. It cannot be developed without developing the Bedouin community, so that it may keep its traditions while joining the modern world." Peres described himself as a "Ben-Gurionist", after his mentor Ben-Gurion. He felt that Jewish sovereignty in the Land of Israel was a means to a progressive end in which the State of Israel both inspire the world and survive in a region of the world where it was unwelcome. As a younger man, Peres was once considered a "hawk". He was a protégé of Ben-Gurion and Dayan and an early supporter of the West Bank settlers during the 1970s. However, after becoming the leader of his party his stance evolved. Subsequently, he was seen as a dove, and a strong supporter of peace through economic cooperation. While still opposed, like all mainstream Israeli leaders in the 1970s and early 1980s, to talks with the PLO, he distanced himself from settlers and spoke of the need for "territorial compromise" over the West Bank and Gaza. For a time he hoped that King Hussein of Jordan could be Israel's Arab negotiating partner rather than Yasser Arafat. Peres met secretly with Hussein in London in 1987 and reached a framework agreement with him, but this was rejected by Israel's then Prime Minister, Yitzhak Shamir. Shortly afterward the First Intifada erupted, and whatever plausibility King Hussein had as a potential Israeli partner in resolving the fate of the West Bank evaporated. Subsequently, Peres gradually moved closer to support for talks with the PLO, although he avoided making an outright commitment to this policy until 1993. Peres was perhaps more closely associated with the Oslo Accords than any other Israeli politician (Rabin included) with the possible exception of his own protégé, Yossi Beilin. He remained an adamant supporter of the Oslo Accords and the Palestinian Authority since their inception despite the First Intifada and the al-Aqsa Intifada (Second Intifada). However, Peres supported Ariel Sharon's military policy of operating the Israeli Defense Forces to thwart suicide bombings. Peres' foreign policy outlook was markedly realist. To placate Turkey, Peres allegedly downplayed the Armenian genocide. Peres stated: "We reject attempts to create a similarity between the Holocaust and the Armenian allegations. Nothing similar to the Holocaust occurred. It is a tragedy what the Armenians went through but not a genocide." Although Peres himself did not retract the statement, the Israeli Foreign Ministry later issued a cable to its missions which stated that "The minister absolutely did not say, as the Turkish news agency alleged, 'What the Armenians underwent was a tragedy, not a genocide.'" However, according to Armenian news agencies, the statement released by the Israeli consulate in Los Angeles did not include any mention that Peres had not said that the events were not genocide. On the issue of the nuclear program of Iran and the supposed existential threat this poses for Israel, Peres stated, "I am not in favor of a military attack on Iran, but we must quickly and decisively establish a strong, aggressive coalition of nations that will impose painful economic sanctions on Iran", adding "Iran's efforts to achieve nuclear weapons should keep the entire world from sleeping soundly." In the same speech, Peres compared Iranian President Mahmoud Ahmadinejad and his call to "wipe Israel off the map" to the genocidal threats to European Jewry made by Adolf Hitler in the years prior to the Holocaust. In an interview with Army Radio on 8 May 2006 he remarked that "the president of Iran should remember that Iran can also be wiped off the map." However, after his death it was revealed that Peres had said that he prevented a military strike on Iran's nuclear program that had been ordered by Benjamin Netanyahu and Ehud Barak in 2010. Peres was a proponent of Middle East economic integration. Peres is regarded as one of the founders of Israel's technology sector. Through personal meetings with the French government, he established collaboration treaties with France's nuclear industry in 1954. In 1958, he founded the re-organized RAFAEL Armament Development Authority, under the MOD's jurisdiction. From his desk he would control all aspects of Israel's nuclear program (first as Director-General and after 1959 as Deputy-Minister. In the 1980s, he is credited with having laid the economic foundations for Israel's start-up economy. In later years, he developed an obsessive fascination with nanotechnology and brain research. He believed that brain research would be the key to a better and more peaceful future. He launched his own nanotechnology investment fund in 2003, raising $5 million in the first week. In 2016, he founded the 'Israel innovation center' in the Arab neighbourhood of Ajami, Jaffa. The center aims to encourage young people from around the world to be inspired by technology. Laying its foundation stone on 21 July 2016, Peres said: “We will prove that innovation has no limits and no barriers. Innovation enables dialogue between nations and between people. It will enable all young people – Jews, Muslims and Christians — to engage in science and technology equally." Peres announced in April 2013 that he would not seek to extend his tenure beyond 2014. His successor, Reuven Rivlin, was elected on 10 June 2014 and took office on 24 July 2014. In July 2016, Peres founded the 'Israel innovation center' in the Arab neighbourhood of Ajami, Jaffa, aiming to encourage young people from around the world to be inspired by technology. On 13 September 2016, Peres suffered a severe stroke and was hospitalized at Sheba Medical Center. His condition was reported to be very serious, as he had suffered a massive brain hemorrhage and significant bleeding. Two days later, he was reported as being in a serious but stable condition. However, on 26 September, an examination found irreversible damage to his brainstem, indicating that it was not possible for him to recover, and the following day, his medical condition deteriorated significantly. He died on 28 September at the age of 93. On hearing of his death, tributes came from leaders across the world. The President of Russia, Vladimir Putin said: "I was extremely lucky to have met this extraordinary man many times. And every time I admired his courage, patriotism, wisdom, vision and ability." The President of China, Xi Jinping said: "His death is the loss of an old friend for China." And the President of India, Pranab Mukherjee said: "Peres would be remembered as a steadfast friend of India." The President of the United States, Barack Obama said: "I will always be grateful that I was able to call Shimon my friend." The funeral was held at Mount Herzl in Jerusalem on 30 September 2016, with his burial place in the Great Leaders of the Nation section between former Israeli Prime Ministers Yitzhak Rabin and Yitzhak Shamir. About 4,000 mourners and world leaders from 75 countries attended the funeral, with President Barack Obama among those who gave a eulogy. Since the funeral for Nelson Mandela, this was only the second time Obama traveled overseas for the funeral of a foreign leader. Prime Minister Benjamin Netanyahu also spoke. Among the other delegates in attendance and speaking were former President Bill Clinton. Other delegates included PA President Mahmoud Abbas, President Francois Hollande of France, Prime Minister Justin Trudeau of Canada, German President Joachim Gauck, President Enrique Peña Nieto of Mexico and King Felipe VI of Spain. The UK delegation included Prince Charles, Foreign Secretary Boris Johnson, former Prime Ministers David Cameron, Gordon Brown, and Tony Blair, and Britain's chief Rabbi Ephraim Mirvis. In May 1945, Peres married Sonya Gelman, whom he had met in the Ben Shemen Youth Village, where her father served as a carpentry teacher. The couple married after Sonya finished her military service as a truck driver in the British Army during World War II. Through the years Sonya chose to stay away from the media and keep her privacy and the privacy of her family, despite her husband's extensive political career. Sonya Peres was unable to attend Shimon's 2007 presidential inauguration ceremony because of ill health. With the election of Peres for president, Sonya Peres, who had not wanted her husband to accept the position, announced that she would stay in the couple's apartment in Tel Aviv and not join her husband in Jerusalem. The couple thereafter lived separately. She died on 20 January 2011, aged 87, from heart failure at her apartment in Tel Aviv. Peres was a cousin of actress Lauren Bacall (born Betty Joan Persky), although the two only discovered this in the 1950s. He said: "In 1952 or 1953 I came to New York... Lauren Bacall called me, said that she wanted to meet, and we did. We sat and talked about where our families came from, and discovered that we were from the same family". Peres was a lifelong writer of poetry and songs. As a child in Vishnyeva, Poland he learned to play the mandolin. He wrote his first song when he was 8. He was inspired to write, including during cabinet meetings. Many of his poems were turned into songs, with the proceedings of the albums going to charity. His songs have been performed by artists including Andrea Bocelli and Liel Kolet. The most recent of his songs was "Chinese Melody" (recorded in Mandarin with Chinese and Israeli musicians), released in February 2016, which he wrote to celebrate the Year of the Monkey (Music Video of 'Chinese Melody' on YouTube). During his presidency (2007–2014), Shimon Peres was noted for his embrace of social media to communicate with the public, being described as 'Israel's first social media president' which included producing comedic videos on his YouTube channel such as 'Be my Friend for Peace' and 'Former Israeli President Shimon Peres Goes Job Hunting'. After retirement, he led a viral campaign to encourage children to study mathematics. In one video, he sends his answer to the teacher by throwing a paper plane (Video: Shimon Peres throws a paper airplane in the name of education on YouTube). According to the Wall Street Journal, his presence on platforms such as Snapchat, allowed him to "pack more punch—and humor—into the causes he championed, especially peaceful coexistence with the Palestinians." Following his death, it was announced that Israel's Negev nuclear reactor and atomic research center, that had been constructed in 1958, would be named after Peres. Netanyahu stated: "Shimon Peres worked hard to establish this important facility, a facility which has been very important for Israel's security for generations.."
1957: Commander of the Legion of Honour. 1994, 10 December: Nobel Peace Prize together with Yitzhak Rabin and Yasser Arafat. 2008, 18 November: Honorary doctorate of Law from King's College London. 2008, 20 November: Honorarily appointed Knight Grand Cross of the Order of St Michael and St George. 2012, 13 June: Presidential Medal of Freedom from US President Barack Obama. 2014, 19 May: The United States House of Representatives voted on H.R. 2939, a bill to award Peres the Congressional Gold Medal. The bill said that "Congress proclaims its unbreakable bond with Israel." 2015, 31 May: The Solomon Bublick Award of the Hebrew University of Jerusalem, in recognition of his contributions to the State of Israel, the pursuit of peace, higher education, and science and technology. ^ "Peres". Collins English Dictionary. ^ a b c d Tore Frängsmyr, ed. (1995). "Shimon Peres, The Nobel Peace Prize 1994". The Nobel Foundation. ^ a b "THE JORDAN-ISRAEL ACCORD: THE OVERVIEW; ISRAEL AND JORDAN SIGN A PEACE ACCORD". archive.nytimes.com. ^ a b "The Peres Center for Peace - Who We Are". Archived from the original on September 27, 2016. Retrieved September 29, 2016. ^ Levine, Daniel S. (September 27, 2016). "Shimon Peres Dead: How Did the Former Israeli Prime Minister Die?". Heavy. Retrieved September 28, 2016. ^ Wootliff, Raoul (September 28, 2016). "Shimon Peres, the last of Israel's founding fathers, dies at 93". The Times of Israel. Retrieved September 28, 2016. ^ "Shimon Peres". The Knesset's internet site. Retrieved August 28, 2008. ^ "Shimon Peres:The Eighth Prime Minister". Prime Minister of Israel's internet site. Retrieved August 28, 2008. ^ "Location of Wiszniew on the map of the Second Polish Republic in the years 1921–1939". jewishinstitute.org.pl. Archived from the original on July 19, 2011. ^ "Knesset Member, Shimon Peres". Knesset. Retrieved February 13, 2008. ^ a b c d "Shimon Peres – Biography and Interview". American Academy of Achievement. 2017. ^ "Peres: Not such a bad record after all". The Jerusalem Post. November 10, 2005. Retrieved August 13, 2014. ^ Anderman, Nirit (August 13, 2014). "Shimon Peres remembers 'very strong, very beautiful' relative Lauren Bacall". Haaretz. Tel Aviv. ^ Joseph Telushkin. Rebbe. Page 132. HarperCollins, 2014. ^ Levi Julian, Hana (July 12, 2007). "President Shimon Peres Agrees to Keep Shabbat--Once". Arutz Sheva. Retrieved September 27, 2016. ^ "SHIMON PERES". Archived from the original on September 27, 2016. Retrieved September 29, 2016. ^ a b "בית הנשיא". GOV.IL. ^ a b c d e f g h i j k Bergersept, Marilyn (September 27, 2016). "Shimon Peres Dies at 93; Built Up Israel's Defense and Sought Peace". The New York Times. Retrieved September 28, 2016. ^ "Peres to German MPs: Hunt down remaining Nazi war criminals". Haaretz. January 27, 2010. Retrieved January 27, 2010. ^ "Address by Peres to German Bundestag". Mfa.gov.il. January 27, 2010. Retrieved June 12, 2014. ^ a b "Sonia Peres regains consciousness". Ynetnews. May 25, 2007. Retrieved May 25, 2007. ^ "Man in the News: Israeli Model of Endurance; Shimon Peres". The New York Times. August 6, 1984. ^ Bar-Zohar, Michael (2007). Shimon Peres: The Biography. New York, NY: Random House. pp. 75–76. ISBN 978-1-40-006292-8. ^ a b c d e f g h i j k l m "President Shimon Peres – Seventy years of public service". Office of the President of Israel. 2010. Retrieved September 28, 2016. ^ Ziv, Guy. "Shimon Peres and the French-Israeli Alliance, 1954–9". Journal of Contemporary History. 45 (2): 406–429. doi:10.1177/0022009409356915. ^ Cohen, Avner (2013). "The Road to Dimona". Israel and the Bomb. Columbia University Press. pp. 57–78. ISBN 9780231500098. ^ a b Neff, Donald Warriors at Suez, pp. 162–163. ^ Neff, Donald Warriors at Suez, pp. 234–236. ^ Neff, Donald Warriors at Suez, p. 235. ^ Bar-Zohar, Michael (April 22, 2019). "Shimon Peres et l'histoire secrète d'Israël". Odile Jacob – via Google Books. ^ The Protocol of Sevres 1956 Anatomy of a War Plot. University of Oxford. Retrieved September 8, 2011. ^ Mahler, Gregory S. (2012). "Introduction". In Mahler, Gregory S. (ed.). Israel after Begin. SUNY Press. pp. 9–10. ISBN 9781438411699. ^ Meydani, Assaf (2009). "Political Entrepreneurs and Institutional Change: The Case of Basic Law: The Government (1992)". Political Transformations and Political Entrepreneurs: Israel in Comparative Perspective. Springer Publishing. pp. 41-104 (esp.75-76 and 85-85). ISBN 9780230103979. ^ "Israel's wars of choice push its politics further to the right". Al Jazeera. July 22, 2014. ^ Lazar Berman,'Bennett defends actions during 1996 Lebanon operation,' The Times of Israel, January 5, 2015. ^ East, Roger; Thomas, Richard (2003). "Israel". Profiles of People in Power: The World's Government Leaders (1st ed.). Psychology Press. pp. 247–251. ISBN 9781857431261. ^ "Israel Labour head to meet Sharon". BBC News. November 10, 2005. Retrieved June 13, 2007. ^ "Serving 60 Years to Life". Newsweek Europe. December 12, 2005. ^ Verter, Yossi (January 6, 2006). "Under Peres, Kadima would win 42 seats; under Olmert – 40". Haaretz. Archived from the original on January 13, 2006. Retrieved July 21, 2007. ^ Mazal Mualem; Yossi Verter & Nir Hasson (January 9, 2006). "Shimon Peres calls on his supporters to vote Kadima". Haaretz. Archived from the original on January 13, 2006. Retrieved July 21, 2007. ^ "Peres elected Israel's president". BBC News. June 13, 2007. Retrieved June 13, 2007. ^ Jim Teeple, "Shimon Peres Sworn In as Israel's President" Archived July 15, 2007, at the Wayback Machine, VOA News, July 15, 2007. ^ "Shimon Peres: State president, Nobel laureate and now – knight". Haaretz. November 23, 2008. Retrieved July 8, 2009. ^ "Peres becomes Sheikh". June 14, 2011. ^ "Secrets of Ben-Gurion's Leadership". Forward. Retrieved June 12, 2014. ^ Goldberg, Jeffrey. "The Unbearable Smallness of Benjamin Netanyahu." The Atlantic. September 29, 2016. September 30, 2016. ^ "Shimon Peres: From Hawk to Dove". Vision.org. Winter 2000. Archived from the original on May 7, 2007. Retrieved June 13, 2007. ^ a b c Yair, Auron (2003). "Chapter 5 – The Armenian Genocide's Recognition by States: The Israeli Aspect". The Banality of Denial: Israel and the Armenian Genocide (1st ed.). New Brunswick (U.S.A.): Transaction Publishers. p. 127. ISBN 0-7658-0191-4. ^ Robert Fisk. "Peres stands accused over denial of 'meaningless' Armenian Holocaust". Archived from the original on December 14, 2007. ^ "Protest [against] Israeli foreign minister's remarks dismissing Armenian genocide as "meaningless"". Anca.org. Archived from the original on March 1, 2005. Retrieved June 12, 2014. ^ Ravid, Barak (August 26, 2007). "Peres to Turks: "Our stance on Armenian issue hasn't changed"". Haaretz. Retrieved June 12, 2014. ^ Pfeffer, Anshel. "Peres: 'Fight terror – reduce global dependence on oil'", Haaretz. May 5, 2008. ^ "President Shimon Peres - Seventy years of public service". Retrieved September 29, 2016. ^ Ravid, Barak; Efrati, Ido (September 14, 2016). "Former President Shimon Peres in Induced Coma After Suffering Major Stroke" – via Haaretz. ^ staff, T. O. I.; AFP. "Peres to remain sedated, condition still 'serious but stable'". www.timesofisrael.com. ^ "Former Israeli President Shimon Peres' Medical Condition Deteriorates After Major Stroke". September 27, 2016 – via Haaretz. ^ Baker, Peter (September 13, 2016). "Shimon Peres, Former Prime Minister of Israel, Suffers a Stroke". The New York Times. ISSN 0362-4331. Retrieved September 28, 2016. ^ Wohlgelernter, Elli (September 28, 2016). "Shimon Peres, former president and veteran Israeli statesman, dies at 93". The Jerusalem Post. Retrieved September 28, 2016. ^ "Shimon Peres's Reflections on War, Peace and Life". The New York Times. Retrieved September 28, 2016. ^ "World leaders to attend funeral for Israel's Shimon Peres". BBC News. September 28, 2016. Retrieved September 28, 2016. ^ Peter Beaumont (September 30, 2016). "Shimon Peres funeral: Obama evokes 'unfinished business' of peace talks". The Guardian. Retrieved October 1, 2016. ^ a b Fay, Greer (January 20, 2011). "Jerusalem Post article on Sonya Gelman". The Jerusalem Post. Retrieved June 12, 2014. ^ Cebedo, Earl (January 20, 2011). "Wife of Israeli President Shimon Peres dies". All Voices. Archived from the original on January 14, 2014. Retrieved June 26, 2013. ^ Raphael Ahren (September 28, 2016). "Larger than life: Shimon Peres, a legacy in pictures". The Times of Israel. Retrieved May 29, 2017. ^ "Headlines - King's News Centre - King's College London". www.kcl.ac.uk. ^ a b "H.R. 2939 – Summary". United States Congress. Retrieved May 20, 2014. ^ Marcos, Cristina (May 19, 2014). "House votes to award medal to Israeli president". The Hill. Retrieved May 20, 2014. ^ "Awarding of the 2015 Solomon Bublick Prize to President Shimon Peres". afhu.org. American Friends of Hebru University. Archived from the original on January 16, 2017. Retrieved January 13, 2017. "Shimon Peres collected news and commentary". The New York Times. Peres's metaphysical propensity to lose by Matthew Wagner, published in The Jerusalem Post, November 10, 2005.